According to this map, Nisenan (pronounced nish-n-non) land included part of Yuba and most of Nevada, Placer and El Dorado Counties, which stretch west from Lake Tahoe at the bend in California's eastern boundary. Just north is Maidu homeland. The brief history that follows is taken from material researched by Richard Johnson, Tribal Council Chairman of what remains of the Nisenan tribelets. Based on census data he estimates conservatively that there were about 7000 Nisenan people shortly before the gold rush in 1848. This was reduced by half in two years, to about 3500 people in 1850. By 1867 only about 500 remained, and now only 18 Nisenan remain counted. Hear these and other observations from Richard Johnson in person in the interview video below from their website: nevadacityrancheria.org. Richard Johnson, grandson of Peter and Margaret Johnson, was the last Nisenan born on the Nisenan reservation (Rancheria), in 1949. The reservation was closed by the Federal government two years later and all remaining Nisenan homes were burned to the ground, including that of Richard's parents. These were simple one-room cabins with a bed, table, chair and stove all in the small room. There was no plumbing for water and sanitation, and no electricity or refrigeration. Richard's parents had to walk two miles to town (Nevada City) for what meager food and supplies they could afford. Before the gold rush the Nisenan people lived in clusters of shelters, each called a Hu. They were built by digging a 3 to 4-foot deep hole and adding a 10 to 20-foot arched roof covered with one foot of dirt. The roof was supported by a forked tree with its base charred to resist insects and decay, and had a central smoke hole for a fire. A single entrance faced east, away from the prevailing wind. Chairman Johnson presented this information and much, much more, in a public lecture on May 21, 2015 at the Nevada County Madelyn Helling Library. Video disks of the lecture are available by arrangement with the Nevada County Historical Society. Richard may eventually make the lecture, and its many beautiful and well-organized slides, available on their website. According to Richard Johnson, his and other Nisenan families can trace their roots back 5 to 7 generations to before the start of the gold rush. When the miners arrived they would drive their mules across Nisenan grass lands, which greatly upset the Nisenan because native grasses were one of their main sources of food, much as we have wheat and rye now. Nisenan's food ranged over everything that was edible, including bugs and grubs in addition to tubers and their staple acorns and native grass seed. 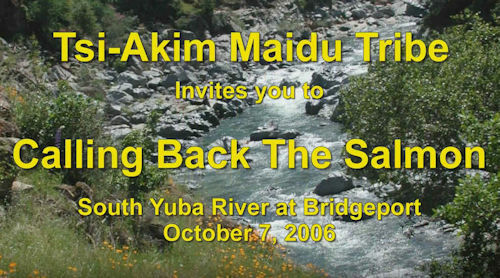 The Tsi Akim Maidu claim this region to be their native land, in conflict with a similar claim by the Nisenan (Southern Maidu). A summary of the claims is given at Nisenan and Tsi Akim.